Rating: 6.1/10. From 26 votes. Summary: The description, specs, photo and pricing for the CZ Scorpion EVO 3 S1 pistol. 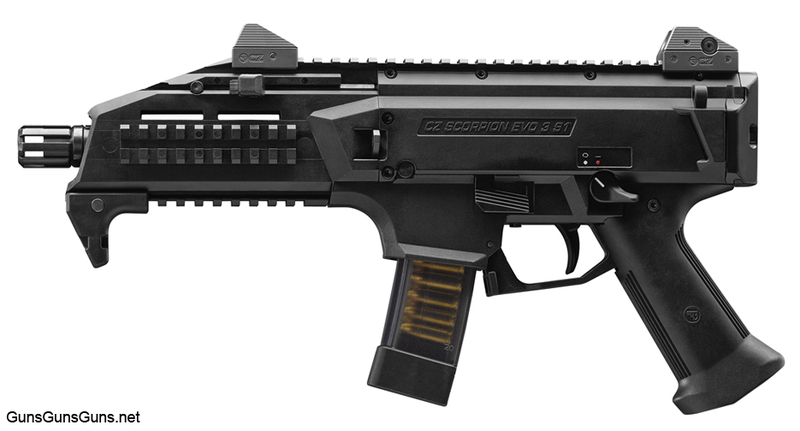 The CZ Scorpion Evo 3 S1 from the left. CZ also offers an arm brace adapter that adds an AR-style pistol buffer tube to the rear of the action, enabling the use of an arm brace (e.g., the SIG brace) for added stability. CZ says the gun will be available in the United States in early 2015. This entry was posted in $751-$1,000, 9mm, CZ, Full size, Semiauto on January 6, 2015 by Staff.